Available for people of all ages, assisting them in the recovery and rehabilitation from all types of illness, injuries and other health problems. Skilled intermittent home care that is physician ordered is provided by registered nurses; physical, occupational and speech therapists and nurse aides. Areas served include: Gage, Jefferson, Pawnee and Saline counties. BCH Home Care is a Homecare Elite Top Agency award recipient. Designed for individuals who want to stay in their own home but need care and support to do so. Services are hands on; including medical care and assistance to help in the activities of daily living. Trained staff -- including registered nurses, Home Health aides, licensed practical nurses, homemakers and companions -- are available to provide a network of services. All patient care is directed by a registered nurse. Peronal Nursinig Care is licensed by the State of Nebraska. A philosophy of care which believes that when a cure is no longer possible, a special kind of caring can enhance the quality of life remaining for the patient and their family. Care is directed by an interdisciplinary team which works closely with the patient's physician to achieve not only physical comfort, but also emotional, social and spiritual well-being. 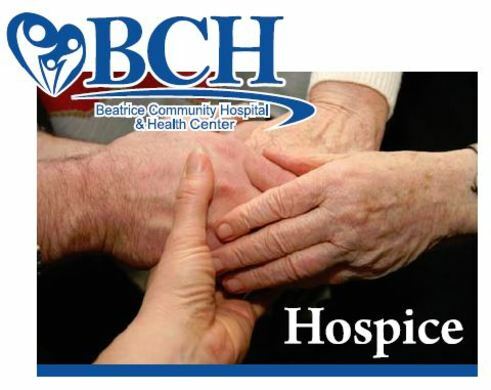 Hospice is Medicare and Medicaid approved and licensed by the State of Nebraska. An emergency response system, worn by the individual, which provides comfort and assurance that help will be available at the push of a button in case of an emergency or a fall. Available for infants, children and youths up to the age of 19, and adults. The full regimen of required childhood immunizations are offered. The clinic is located at 1110 Jackson St., Beatrice. Appointments are required. Call 402-223-2366.